Springtime a year ago we were pleased to contribute to a Kickstarter campaign for a new kind of bike light called Magnic Light. There was a lot of speculation voiced in various forums whether it was a hoax, because the physics involved defied most peoples' understanding. If this very simple invention was for real, why hadn't it already been invented? "Everybody said 'that's impossible.' Then somebody came who didn't know that, and did it." We're happy to have received our first shipment straight from inventor Dirk Strothmann in Germany, for sale right now. Wait, it's August, not even dark until late? More about that in a bit. I've got them on the only bike I own without built-in lights, a Brompton. Everybody who likes playing with magnets, magic tricks, or seeing and being seen on a bike smiles, and some even laugh in amazement to see Magnic Lights work. Come by for a demo. 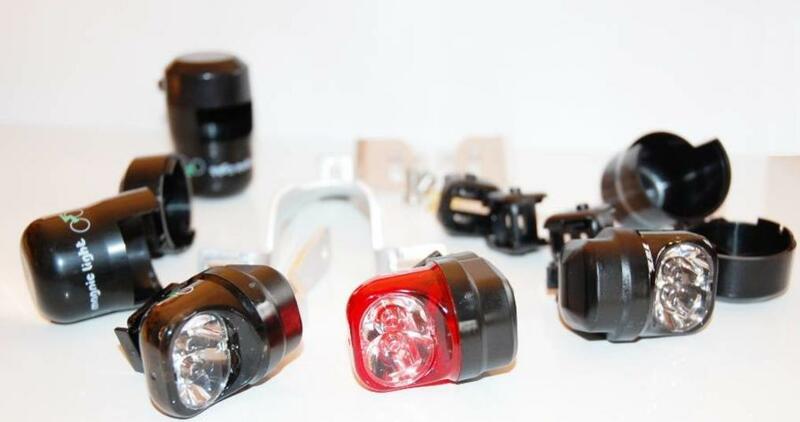 Magnic Lights are very bright, lightweight, incredibly efficient bike lights that use no batteries, are self-contained, and don't require building a wheel around a dynamo hub. This makes them a game-changer, I dare say historic because I think someday most bike lights are bound to work similarly. All you do is position the small light units in proximity to any normal metal bike rim, and they work. Unlike superficially similar "be seen" products like Reelights, these don't require mounting magnets in your wheel, and are plenty bright enough to be your only lights. This is the jaw-dropping part: just the motion of the metal rim itself, not magnetic or even necessarily ferrous, is enough to power the lights. No contact or noise, no external parts or wiring, lighter weight and an order of magnitude less drag than the very most expensive dynamo hubs. There's no such thing as free energy, but any resistance created by Magnic Lights is utterly negligible, even with a wheel turning free in a stand, for minutes. They boast the brightest dynamo taillight on the market (aim carefully please! ), and while the headlights don't measure up in brightness or beam shaping to the best available, they aren't too shabby either. They run about $250 for a set of 3: 2 headlights and a taillight. That's more than most battery systems, but less than most dynamo systems not built in at the factory. And if you are really focused on high efficiency and light weight, whether for practical, aesthetic or obsessive reasons, Magnic Light is simply the best bicycle lighting system there is. This concept could not previously have been realized practically because only recently have rare earth magnets become powerful enough, and LEDs efficient enough, for supply and demand to meet, so to speak. It turns out that any conductive material such as an aluminum rim - not just magnetic or ferrous - will produce so-called eddy currents when moving through a magnetic field. This invention harnesses these currents to turn a tiny generator without contact. There are some issues. The biggest for people like us who use bikes to carry stuff is that since the lights and the generator units are integrated, they can be mounted only in locations that provide the correct small rim clearance and good light placement simultaneously. The provided mounting hardware doesn't have an answer for rear racks, whose mounted luggage will block the light. If you don't have either a skinny-tire fenderless road bike (Portland?! ), or a bike with cantilever brake studs, there are only somewhat compromised mounting options. What's more there's no standlight, so you go dark when not moving. We'll make sure you understand all these issues before selling you a set: please bring your bike if at all possible. We're pretty sure it's just a matter of time before the technology makes its way into more form factors, with broader feature sets. How about a stand-alone generator you connect to fork blade or seatstay that has power out for standard lights and other electronics? For now, for many, being an early adopter of the first, purest expression of the idea is part of the appeal. What's wrong with cheap simple battery lights, anyway? No matter how much better they are than, say, 10 years ago, the inescapable reality is that the more you use them, and the brighter they are, the faster they burn out. The bigger the battery, the heavier and more fragile the light when dropped. Nobody would accept this dynamic in any other form of transportation. Battery lights are essentially disposables, at odds with the sustainable elegance of bicycles that can serve for decades. What dynamo lights bring to the table, that battery lights never will, is liberty to run them IN THE DAYTIME. All the time, without a care in the world. With no bulbs to burn out and no resistance perceptible, why not? Tipped up just a bit, today's brighter LED lights are conspicuous a mile away in broad daylight! No battery light is bright enough to be useful in daytime without committing the user to a really onerous recharging scheme all the time. To my thinking, that's a better single safety investment than a wardrobe full of day-glo plastic garments and even a crash helmet for non-sport biking, because it can ward off rather than mitigate collisions. Our experience running bright daytime lights supports the conclusion of studies conducted with motorcycles, that they draw significant notice from other road users, preventing right-of-way violations in particular. One last thing: one reason that battery operated lights have remained popular, apart from their lower initial expense, is that they can easily be transferred from bike to bike. If you care enough about safety and convenience to value the benefits of generator lighting, there's a good chance you own more than one bike. But then, equipping multiple bikes with generator lighting can be prohibitively expensive. Magnic Lights can be moved from one bike to another in seconds with no tools: only the inexpensive mounts need installation in advance.